The 2017-2018 concert season of the Delaware Symphony Orchestra will begin on Friday, September 15, 2017, at The Grand Opera House in Wilmington, with a concert conducted by Music Director David Amado that features the best known work in the symphonic repertoire, Beethoven’s Symphony No. 5. The concert will be repeated on Sunday, September 17, at Cape Henlopen High School in Lewes. 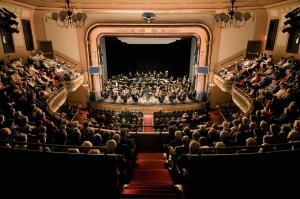 The season totals five Classics Series concerts at The Grand, four Chamber Series concerts in the Gold Ballroom of the Hotel du Pont, three Family Concert performances in Milford and at the Laird Center at The Tatnall School in Greenville, and two Explorer Concerts for children in Wilmington and Dover. In addition to the Fifth Symphony, which continues the Orchestra’s survey of the major works of Beethoven, the September concerts will feature Prokofiev’s Symphony No. 1, “Classical,” and the Mozart Concerto for Flute and Harp, with DSO soloists Kim Reighley, flute, and Sarah Fuller, harp. The concerts are at 7:30 p.m. Friday, September 15, at The Grand, and 3:00 p.m. Sunday, September 17, at Cape Henlopen High School in Lewes. David Amado will give a pre-concert talk one hour before each concert. The remaining 2017-2018 Classics Series concerts will all take place on Friday evenings November 16, 2017, and January 26, March 23, and May 18, 2018, at 7:30 p.m. in Copeland Hall at The Grand Opera House on North Market Street in downtown Wilmington. Full program information and commentary on each concert are included in the new DSO website at www.delawaresymphony.org. All seats for Classics Series concerts are reserved, with single ticket prices of $14, $45, and $75. Tickets are $10 in any section for students age 21 and under with ID. Additional Grand Opera House Box Office fees apply. Tickets are available at The Grand Opera House Box Office by phone at 302-652-5577, in person at 818 North Market Street, Wilmington, or at www.ticketsatthegrand.org. Discounted five-concert Classics Series subscriptions are available until September 15, 2017, for $60, $195, and $335; student subscriptions are $50. To order subscriptions, or for group rate information, contact the DSO office at 302-656-7442, ext. 1000, or visit the website, www.delawaresymphony.org. The DSO’s Chamber Series concerts begin on Tuesday, October 17, 2017- music of Mozart and Ravel and the Brahms Piano Quintet, with pianist Lura Johnson and members of the DSO. The following Chamber Series events are December 12- Suite from The Nutcracker performed by a DSO Brass Quintet; February 20, 2018- commemorating the 50th anniversary of the death of Martin Luther King, Jr. with a selection of spirituals sung by bass-baritone Kevin Deas, and the Olivier Messiaen Quartet for the End of Time; and April 24, 2018- music of Schnittke and Haydn, and the Beethoven Symphony No. 4, with David Amado conducting a DSO Chamber Orchestra. All Chamber Series concerts are on Tuesdays, at 8:00 p.m., in the Gold Ballroom of the Hotel du Pont. Tickets are $60 each, with a 4-concert subscription at $220 (plus handling fees). Ticket prices include a complimentary coffee and dessert buffet at intermission, with other beverages for sale. Tickets are available through the DSO Office only, at 302-656-7442, ext. 1000, or at tickets@delwaresymphony.org. In addition to the new season, the Orchestra has unveiled a new look, with a new logo and a new website, heralding a new era for the 111-year-old Orchestra. Executive Director Alan Jordan added, “Some of the greatest and most important works ever written are included in the DSO&apos;s 2017-2018 season line-up. From Debussy&apos;s La Mer to The Rite of Spring; from Beethoven&apos;s Fifth to Mahler&apos;s Seventh, the DSO will offer musical experiences that are beyond words; all presented right here in Delaware!" echoing the DSO’s new tagline and emphasizing the orchestra’s value of access for all. The 2017-2018 season of Delaware Symphony Orchestra Concerts is introduced on the newly launched website at www.delawaresymphony.org. Information on the Orchestra’s Family Concerts in November, 2017, the Explorer Concerts in March, and all additional programs, will also be forthcoming on the orchestra’s website. The Delaware Symphony is one of the premier regional orchestras in the United States and Delaware’s only fully professional orchestra. The DSO has been an integral part of the First State’s cultural life since 1906. Recognized for artistic excellence, the Symphony presents classical and contemporary repertoire in full orchestra and chamber music concerts, educational programs, and special events that attract audiences from throughout the Delaware Valley region. In 2010, the orchestra released a highly acclaimed first recording on the Telarc label with the Los Angeles Guitar Quartet. For more information, visit delawaresymphony.org or call the DSO office at (302) 656-7442 or www.delawaresymphony.org. Music Director since 2003, David Amado leads the DSO with musical excellence, connecting with audiences through fine musicianship and energetic performances. Dedicated to musical enrichment, Amado continues his tradition of popular pre-concert talks, and he also teaches and coaches young conductors at Philadelphia’s Curtis Institute of Music and at the Atlantic Music Festival in Maine. In addition to his Delaware post, In April, 2016, David Amado was also named Music Director of the Atlantic Classical Orchestra in Florida. 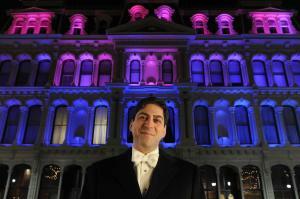 His national and international conducting appearances have brought increasing recognition to the DSO, and at home in Delaware he received the 2014 Governor’s Award for the Arts.